One of the more frustrating patterns for many Technical and Retail Traders are the Flat Tops that form today. These new Topping Formations surprise many traders and result in whipsaw trades and losses with breakouts to the downside. What appears to be a solid Consolidation, Platform, or other Sideways Pattern that would continue to move price upward suddenly breaks to the downside with no obvious reason. By dissecting the Price, Time, and Quantity data on a chart Technical and Retail Traders can learn to identify when a stock in a Consolidation, Platform, or other Sideways Pattern is under Quiet Rotation™ selling pressure that does not show in Price or Candlesticks as a downward action. 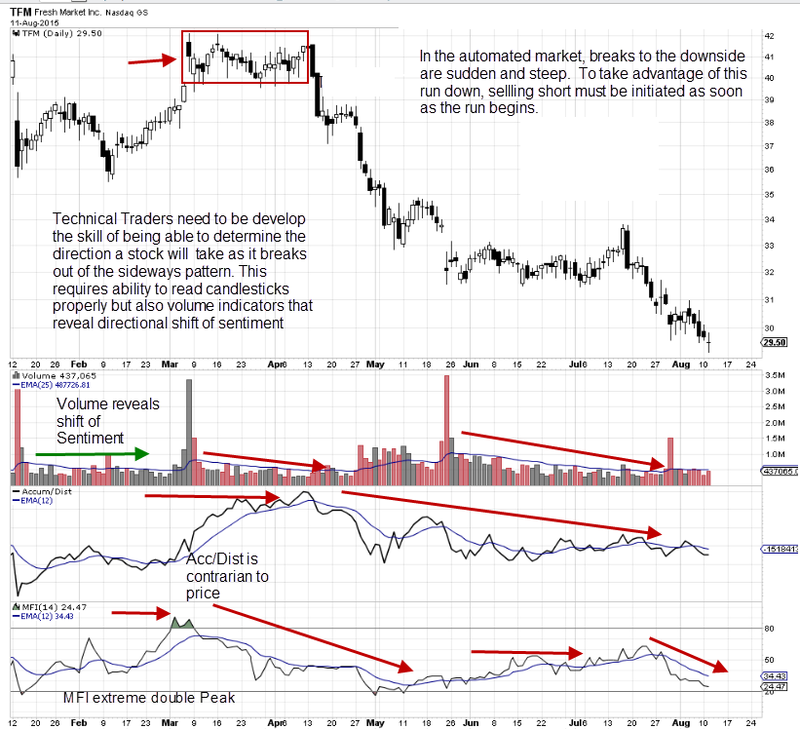 Most Technical and Retail Traders assume that if large quantities of stock are being sold, it will show up in the chart as a downtrend or run down. No longer is this a viable assumption due to new order types for the giant Institutions, who use Dark Pools and new processing systems on several dozen trading venues. A stock can be under heavy selling pressure without disturbing price or maintaining it in a Consolidation or Platform, until sudden breakouts to the downside occur surprising most Traders. See chart example #1 below for Fresh Market, Inc. (NASDAQ: TFM) below. When a Technical Trader is able to read a sideways price action as easily as they read a run up or down, they are able to trade more stocks with higher profitability and their ability to enter the run sooner increases. There are several clues at this stage of the stock chart development that indicate which direction price will break. First of all, the indecision candlesticks within the sideways action reveals a weakness for an upside breakout. This stock is barely containing the heavy selling pressure from Quiet Rotation by giant Institutions trading off exchanges on Dark Pools. This hidden selling pressure is seen in the shorter duration of runs, the weaker run gain potential, and the prevalence of longer wicks on Candlesticks. The Candlesticks are also not forming a tight sideways Consolidation with a consistent low basing pattern, which is indicative of an upside breakout. This Consolidation low range wavers up and down, a common sign of selling pressure. The March black Volume spike by High Frequency Traders HFTs is often an exhaustion pattern, and the Volume bars that follow are declining steadily which is easily seen using an Exponential Moving Average EMA. Compare that to the prior red Volume spike in January, where Volume maintained its average and price moved up. Confirmation of this analysis is with the Accum/Dist Indicator showing a selling pressure within quantities to the downside, and a steady decline on Flow of Funds out of the stock as it moves sideways. All Candlesticks and Indicators confirm this stock is under heavy rotation that is hidden within price which is moving sideways. Chart example #2 is of the same stock and shows what happened in the following months. Breakouts to the downside in the automated marketplace are faster than they were even a decade ago. This is due to changes in Market Structure, elimination of the Uptick Rule, increased HFT activity, more giant Institutions using Dark Pools, and the decision to use Decimals instead of Fractions. Although these changes occurred a decade or more ago, the patterns that are forming on charts are continuing to change as new trading venues, professional order types, professional strategies, indicators, and tools are developed and used by the giant Institutions and the Professional Traders. A complete compliment of indicators designed to reveal where these Professionals are selling before price collapses is necessary. Otherwise the Retail Trader has no means of being able to prepare for sudden sell offs, sheer cliff collapsing price on what seemed to be a strong Consolidation, or a huge gap down that creates a significant loss. Technical and Retail Traders must learn to trade with the Professionals rather than trading against them, whereas often Traders discover they are in the predicament of being on the opposing side. I invite you to visit my website TechniTrader.com to learn more about trading and investing. Click the button below.